at home when you use the same equipment, you may not even get 50% of ease and the result of what was seen…. Cooking is an art – not all are adept… some make the preparations in a nice and calm manner…. 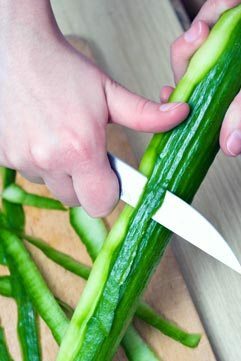 Some vegetables require their skin to be peeled off – almost all vegetables need to be cut and only some cut them artistically. Apsara, Nataraj, Camlin, Cello, Flora ….and more... sure we all enjoyed writing with pencils…. In fact in olden days, a pencil would be dumped only when it would become too small to be held / gripped in hand – some even used – used pen caps as holder for such small size pencils….. it is a technological marvel – simple one made of thin wood bonding the lead writing instrument. Pencils create marks via physical abrasion, leaving behind a trail of solid core material that adheres to a sheet of paper or other surface. They are noticeably distinct from pens, which dispense liquid or gel ink that stain the light colour of the paper. Most pencil cores are made of graphite mixed with a clay binder, leaving grey or black marks that can be easily erased. Graphite pencils are used for both writing and drawing, and the result is durable. The word “pencil” derives from the Latin penicillus, meaning—not so sensibly—“little tail.” It is stated that the average pencil holds enough graphite to draw a line about 35 miles long or to write roughly 45,000 words. There is no recorded history testifying or falsifying this……… there is no risk of lead poisoning if you stab yourself (or someone else) with a pencil because it contains no lead—just a mixture of clay and graphite. In our school days, we used shaving blades to sharpen the pencil – though pencil sharpeners too were available….. primarily one needs to shave away the wooden surface, making the tip of graphite prominent. 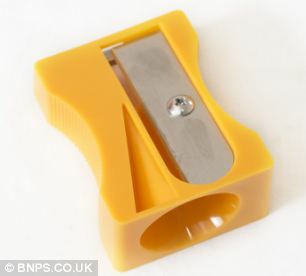 Knifes or blades could hurt and cause bleeding injuries too….. pencil sharpeners are safe and give more uniform result – a neat look adding to the good handwriting [!]. Sharpeners come in many shape though the base function is same – there are mechanical and electrical sharpeners too. Sharpeners have been around for more than 150 years now. Here is something on a vegetable peeler – a kitchen gadget that looks like a pencil sharpener and carts away the vegetables in seconds… it is ‘karoto peeler’ as reported in Daily Mail UK. The report states that it may look like a giant pencil sharpener but the Karoto gadget has been tipped to revolutionise time spent in the kitchen. The quirky contraption is a vegetable peeler that can remove the skin of any root vegetable, including carrots, parsnips, cucumbers and courgettes, in only 30 seconds. The operation is simple - Karoto works just like a sharpener too - insert the vegetable and twist it against the blade to shave off the skin. The quirky Karoto kitchen gadget, pictured, from Israel-based design firm Monkey Business looks like a giant pencil sharpener and can peel any root vegetable including carrots and parsnips in just 30 seconds. The user inserts the vegetable and twists it against the blade to shave off the skin. The shavings of cucumbers and courgettes can also be used to decorate salads. Its creators also claim the time-saving invention is safer than slicing the skin off vegetables compared to a standard peeler or knife. -- 3 and 2. Give me three and ones right here -- 3, 2 and rest.